Go to http://watchtheguild.com for updated info. 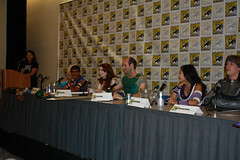 The Guild will be at Comic-Con! We’re pleased to announce that we’ll have a booth, a panel, new merchandise and some surprises. For the second year in a row, we’ll be sharing a booth, so you can find us listed in the exhibitor guide under “Signal Fire Studios/The Guild” and we’re at booth 4201. We can confirm that, at this time, the entire cast of The Guild will be in attendance, and we will have at least one signing opportunity per day at the booth. The Guild’s panel is scheduled for Saturday, July 24th from 2pm to 3pm in the Indigo Ballroom at the Hilton Bayfront hotel, recently announced as one of the new official venues for Comic-Con. After last year’s standing-room only panel, where we had to turn away several hundred fans, we asked for a larger room and the fine folks at Comic-Con were kind enough to honor that request – so big thanks to Comic-Con. The panel will feature a Q&A with the cast along with the premiere of some new content from The Guild. There will be more info and a complete schedule of Guild-related events posted as we get closer to the Con. Join us on Twitter and Facebook for the most up to date info.